When I entered the Whole30 journey, I wanted to try to find one Korean recipe that could be Whole30 compliant. Googling led me to this Whole30 Bulgogi recipe that I will actually keep in my regular rotation since it was a delicious substitute that didn't make me miss normal bulgogi. Since rice wasn't Whole30 approved, eating the bulgogi in lettuce wraps made the most sense, but still required some creative substitutions for the accompaniments (ssamjang sauce and pickled radish/kimchi are definitely not Whole30 friendly). A tweaked recipe for scallion salad (Pa Muchim), pickled onions and Sambal Oelek (hot sauce) provided the perfect toppers for the bulgogi inside the lettuce wrap. And as an bonus, I used ground beef rather than flank steak to speed up the cooking/prep time! 1. Combine beef with the remaining ingredients together and mix to evenly distribute marinade (but don't overmix!). 2. Refrigerate for an hour or overnight. 3. On a skillet over medium-high heat, cook beef until cooked through and no longer pink (5-7 minutes). 1. Cut scallions into 4-inch pieces. Then thinly slice lengthwise. 2. Mix the remaining ingredients with the scallions. 1. Slice red onion thinly. 2. Place onions in a bowl and cover them with vinegar and stir. 3. Let sit for 15 mins-1 hour. Refrigerate leftovers. 1. 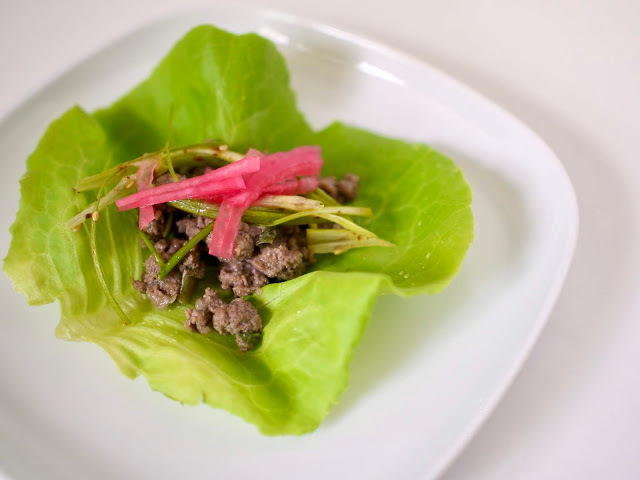 Fill each lettuce cup with a small serving of bulgogi, pa muchim, pickled onions and a dollop of Sambal Oelek.